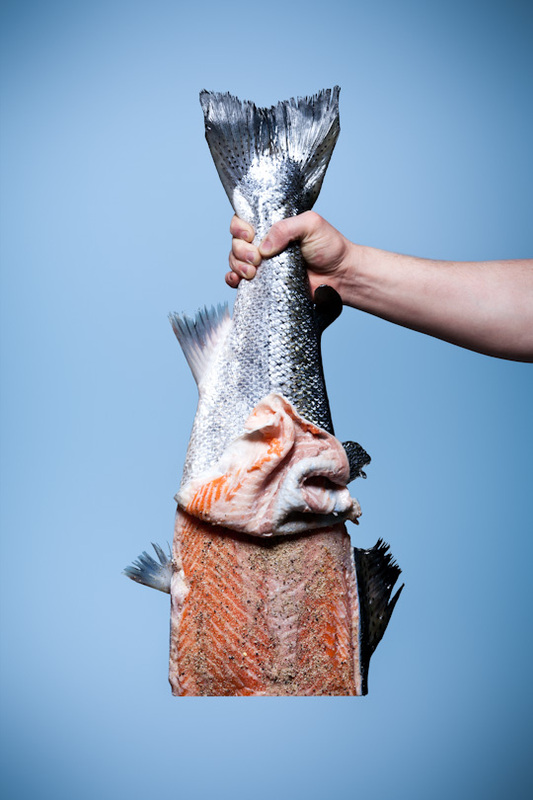 This was the last part of our recent mailer campaign and while the salmon shot is a really simple image, it’s definitely one of my favorites. We tried a variety of different hanging techniques to support the salmon. We tried using the whole fish and variations on it, but ultimately we found Adam (my wonderful assistant) was a great prop to get over the scale of the fish and show off a fun way of supporting it. Trina did a fantastic job of peeling back the skin, one of the outtakes was so perfect where we trimmed the skin it just looked like we did it in post, so we finally worked with this solution, where we pinned the skin back and kept the rub strictly on the exposed portion of the fish. Meanwhile we worked with Sarah to get the “Bake” image just right - here we tried a couple of different models and wound up finding the blonde skin and long hair of Haley Middleton was a perfect match. Definitely a fun shoot, a wonderful mailer and thank you to everyone for all the kind comments we’ve received. PS. The rub does NOT work as a sunscreen.